20/08/13: CR submission deadline has been extended and the links to the format guidelines have been updated. 13/08/13: The list of accepted papers is online. 5/08/13: Mark Harman will give a keynote on "Genetic Programming for Reverse Engineering". 5/08/13: Camera ready deadline has been extended. 26/07/13: Accommodation details have been posted. 17/06/13: Submission deadlines have been extended. 18/04/13: Call for Tool Demos is available. 17/04/13: Call for Workshop Proposals is available. 22/01/13: Dates have been defined. 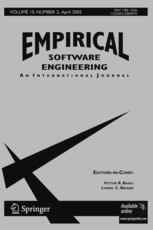 11/01/13: Special issue Empirical Software Engineering Journal. 31/12/12: Our website is up and running!